If you love to garden, there is no reason to be limited by the seasons when you can have a greenhouse for gardening all year round. 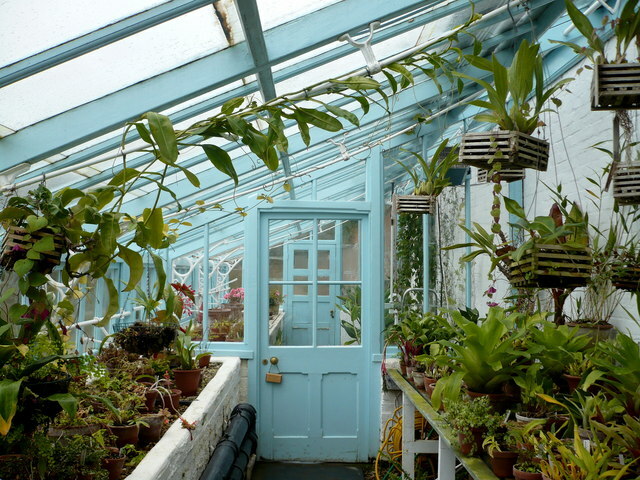 You can enjoy plant production in a greenhouse that often exceeds the yields from a summer garden. We cannot control the extreme climate a summer can bring with heat and storms, but we can control a greenhouse climate for optimum growth. 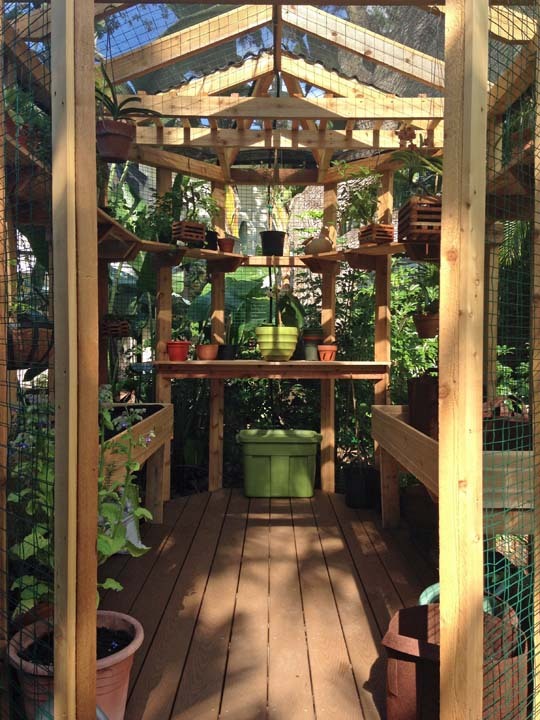 A well constructed greenhouse will involve the installation of heating, humidifying and ventilation systems to provide the necessary warmth and light plants require during the limited sunlight of winter. A proper balance of solar radiation is needed for too much sun exposure can be damaging while shade can provide the needed protection. 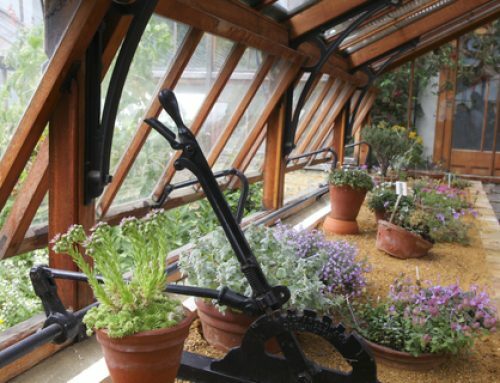 Ventilation is key during the warmer months when too much external heat can affect the levels of humidity inside the greenhouse. A thermal measuring system is useful to determine the needed temperatures for heating and cooling plants. 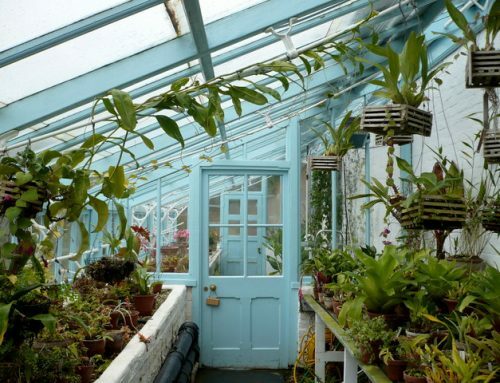 A greenhouse attached to the house comes with the benefits of all the systems provided by the house: water, electricity, shading and coverings. 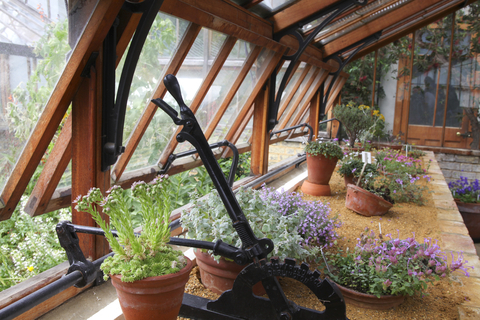 A freestanding greenhouse will require these same systems to be in place for year round growing. Rainwater catchment can be used to collect water from downspouts and gutters for an eco friendly watering system. One can still use this collected rainwater in barrels to sustain an automated watering system that provides interval irrigation. Many greenhouse gardeners today are opting for hydroponic growing as one of several greenhouse gardening methods. These are primarily growers who may be in business, and want to benefit from faster and larger plant yields. I prefer working with soil though there are advantages to growing with water. • Easy feeding of the plants since the plant roots will absorb just the amount of nutrients in the water they need to grow. • Growing plants in water requires less space as well as less time consumed with cultivating soil, sowing and potting. • Hydroponic growing is less maintenance overall. • Root intake of nutrients is faster resulting in earlier and more plentiful yields. • Hydroponic plants tend to have less problems with insect infestation, fungus and disease. I have yet to experiment with hydroponics, but I am interested in trying some plants with this method. I enjoy working with soil, and the mystery of amending the soil to optimum health for successful and healthy growing. I also love the smell of soil with its deep, rich earthy fragrance. As a biodynamic gardener, the soil is everything. I want my soil in the greenhouse to simulate the healthy soil in my outdoor garden. Come spring when I transplant seedlings into the garden, the transition from the greenhouse to the garden is enhanced by having grown the seeds in similar soil. It is very common for seedlings purchased at a nursery to shrivel up and die after they are transplanted into a garden. This is because nursery seedlings are often artificially and chemically enhanced to grow in poor soil so their roots are not yet strong enough to pull nutrients from rich soil. I suppose I am a soil purist. I believe the richness of the soil is what gives grown food its wonderful flavor. I have yet to eat a hydroponic tomato whose flavor can match the juicy taste of a big, red, garden grown tomato. Hydroponics has been around a long time, dating back thousands of years to the Hanging Gardens of Babylon. This method prides itself on faster and greater yields due to the ample oxygen available to the roots. These plants do not require the same energy to grow by having to find soil nutrients, thus this saved energy goes into faster and greater plant production. This speed and volume may be sacrificing richer flavor and nutrition in the process. Though hydroponic growers state their plants grown in water receive all the same nutrients they would get in the soil, I do not feel it is the same apples. For soil undergoes a unique, somewhat mystical process in which to nourish plant life. Though the principles may be the same concerning the intake of nutrients, water and earth are very different elements. If you decide to grow hydroponically in your greenhouse, you will need a growing medium, a grow rock, to support the root systems, such as rockwood, perlite, vermiculite or sand. You will need to test the pH of your system to detect any deficiencies. There are several various hydroponic growing systems: the Wick system, the Ebb and Flow system, the Nutrient Film system and the Continuous Drip system. The Wick system is considered passive non-recovery since it uses no pumps or moving parts. The Ebb and Flow is active recovery since it depends upon a submersible pump. The Nutrient Film uses no growing medium, and constantly feeds suspended roots. The Continuous Drip system supplies nutrients to each individual plant. Though hydroponic growing is being deemed the wave of the future, it has its purpose and limitations. It is certainly a solution for producing fast, large food supplies. Water is a carrier, as it is with nutrients throughout the human body, across the land with glacier melt nutrients and within the ocean with nutrient rich plant life. But we must consider that an abundance of food does not always mean the food contains an essential amount of vitamins and nutrients. Dr. Alexis Carrel, a 1912 Nobel Prize winner warned that “since soil is the basis for all human life, our only hope for a healthy world rests on reestablishing the harmony in the soil…all life will be either healthy or unhealthy according to the fertility of the soil….directly or indirectly, all food comes from soil”. The depletion of healthy soil results in the depletion of healthy water that comes from the ground. Soil is an organism which resonates with the mystery of the cosmos and spiritual energies. 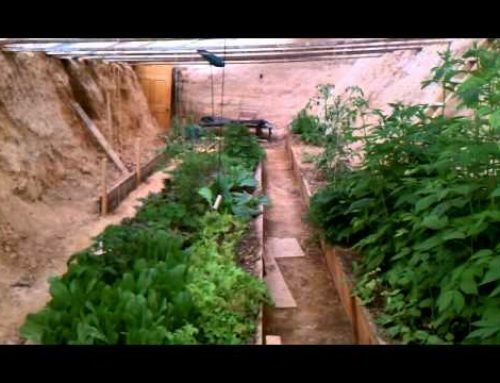 I believe the secrets in the soil can provide us with the secrets to growing an abundance of healthy food. • An opportunity to learn the secrets of healthy soil for both your greenhouse and garden. • Successful transplanting of seedlings from the greenhouse to the garden. • Flavorful and nutrient rich food grown in healthy soil. • No fancy watering systems required. • The ability to grow a larger variety of food. 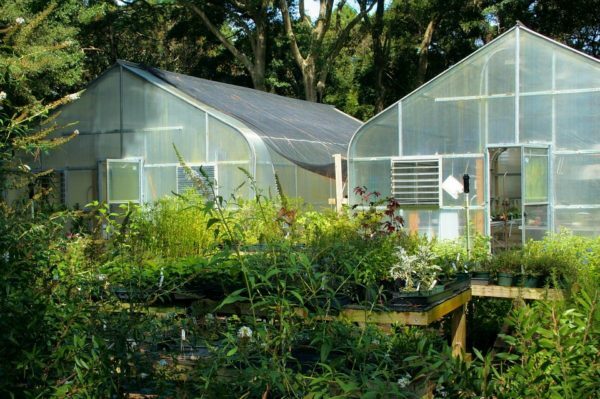 Whether you choose to grow in water or soil, you will want your greenhouse set up for ease and efficiency. 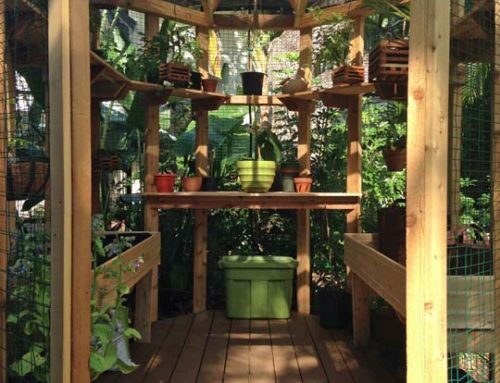 With all the needed tools and systems in place, you will be on your way to abundant and satisfying greenhouse gardening.